Oracle bone script (Chinese: 甲骨文; pinyin: jiǎgǔwén; literally "shell bone writing") refers to incised (or, rarely, brush-written) ancient Chinese characters found on animal bones or turtle shells used in divination in ancient China. Referred to as oracle bones, the vast majority are ox and sheep scapulae and tortoise plastrons which record the pyromantic (divination by means of fire) divinations of the royal house of the late Shang dynasty (商朝) or Yīn Dynasty (殷代), primarily at the capital of Yin (modern Anyang (安陽), Henan Province), and date from around 1200 – 1050 B.C.E. (Boltz 1986; Keightley 1996; Pinyin.info: A Guide to the Writing of Mandarin Chinese). A few are from Zhengzhou (鄭州) and date to earlier in the dynasty, around the sixteenth to fourteenth centuries B.C.E., while a very few date to the beginning of the subsequent Zhou dynasty (周朝, Zhōu Cháo, Chou Ch`ao). The oracle bones were discovered during the 1800s by two Chinese scholars who noticed inscriptions on turtle shells sold in Chinese medicine shops in Peking. The oracle bones were first excavated and cataloged in 1899 from a site in Anyang, near Yinxu (殷墟), the ancient capital of the latter part of the Shang Dynasty of China, located in present-day Henan Province. In these and subsequent excavations near Anyang, more than 100,000 oracle bones have been found, inscribed with more than 1.6 million characters. The study of oracle bone script is an important source for understanding the development of present-day Chinese writing and remains an academic discipline in its own right. Over 4,600 known Chinese characters have been identified; of these; about 1,300 have been deciphered. Oracle bone script is a functional writing system, fully capable of recording language. Though the oracle bone graphs appear simplified, apparently because of the difficulty of engraving characters on the hard, bony materials, the inscriptions themselves indicate that the Shang were already writing with brush and ink on books made of bamboo slats. Because the Shang rulers divined about a wide range of matters, the inscriptions have provided invaluable information about the Shang dynasty, and the daily lives of the kings (de Bary and Bloom 1997). Modern Chinese artists have been able to reconstruct oracle bone script and use it in some of their works. Because turtle shells as well as bones were used, the oracle bone script is also sometimes called shell and bone script. However, the term oracle bone script is by far more common. Bones and shells used in pyromancy have also been found dating back to the Neolithic period, but most are not inscribed, and the symbols on those are not widely recognized as writing. Thus, because the majority of oracle bones bearing writing date to the late Shang dynasty, oracle bone script essentially refers to the Shang script. Rulers of the Shang and Xia dynasties used divination to seek information about the future from their ancestors by means of pyromancy (divination by fire), using the shoulder blades of oxen and sheep and the bottom shells of turtles (plastrons). It appears that characters were first brushed on the bone in red or black ink and then incised with a sharp instrument; heat was then applied to the bone or shell with a hot brand or poker to cause it to crack. The diviner would inscribe on the bone or shell his name, the current date of the sexagesimal cycle, and then inscribe two possible outcomes on the shell. Depending on how the fired object cracked, diviners would interpret the answer from them. For example, statements such as, "We will receive a millet harvest,” and, “We will not receive a millet harvest,” would be inscribed. The diviner would then interpret the cracks and write, “Auspicious. We will have a harvest,” or, “Inauspicious,” on the bone. The oracle bones were first excavated and cataloged in 1899 from a site in Anyang, near Yinxu (殷墟), the ancient capital of the latter part of the Shang Dynasty of China, located in present-day Henan Province. Two scholars from Peking, Wang Jung and Liu Er, are credited with their discovery. Suffering from malaria, Wang Jung was prescribed a Chinese medical remedy containing “dragon bones,” which were usually fossilized animal bones. Wang and Er noticed that the “dragon bones” he purchased from a local pharmacy were inscribed with carvings that resembled some kind of writing (Wertz, "Oracle Bones"). Excavations of Bronze Age sites at Anyang, made from 1928 to 1937 by the Academa Sinica, unearthed objects from the Shang dynasty and also appeared to substantiate the existence of the earlier Xia dynasty (1750 – 220 B.C.E.). In these and subsequent excavations near Anyang, more than 100,000 oracle bones have been found, inscribed with more than 1.6 million characters (Perkins 2000). The vast majority of the oracle bones are ox scapulae and tortoise plastrons which record the pyromantic (divination by means of fire) divinations of the royal house of the late Shang dynasty (商朝) or Yīn Dynasty (殷代)), primarily at the capital of Yin (modern Anyang (安陽), Henan Province), and date from around 1200 – 1050 B.C.E. (Boltz 1986; Keightley 1996; Pinyin.info: A Guide to the Writing of Mandarin Chinese). A few are from Zhengzhou (鄭州) and date to earlier in the dynasty, around the sixteenth to fourteenth centuries B.C.E., while a very few date to the beginning of the subsequent Zhou dynasty (周朝, Zhōu Cháo, Chou Ch`ao). Because the Shang rulers divined about a wide range of matters, including sacrifices and rituals, divine assistance or approval, requests to ancestral and natural powers, sickness, childbirth, disaster, distress, dreams, building of settlements, military campaigns, agriculture, administrative orders, hunting expeditions, and the fortune of the coming ten-day week, the inscriptions have provided invaluable information about the Shang dynasty, and the daily lives of the kings (de Bary and Bloom 1997). The discovery of new oracle bone sites in China continues. During the 1970s, oracle bones dating to the Zhou period were discovered, some from the Spring and Autumn period of the later Zhou Dynasty. The most recent discovery, in an excavation located southeast of the Daxinzhuang Shang ruins, where 30 "tanfang" (artificial pits measuring 10x10 meters or 5x5 meters) were found, was announced on April 8, 2003. Eight pieces carrying oracle bone script were excavated; four of them form one whole piece, with 25 characters. The shape of the bones, the characters, and grammar indicate that they belong to the same group of inscriptions unearthed at the original site in Anyang City (Wertz, "Oracle Bones"). The late Shang oracle bone writings, along with a few contemporary characters in cast bronzes, constitute the earliest significant corpus of Chinese writing, but may not be the earliest Chinese characters. 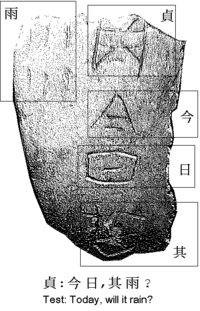 Some archaeologists have proposed that Jiahu Script, sixteen markings discovered on prehistoric artifacts found in Jiahu, a neolithic Peiligang culture site in Henan, China which date to 6600 B.C.E., resemble oracle bone characters such as 目 (“eye”), and 曰 (“sun; day”); others doubt that the markings represent writing at all. The study of oracle bone script is an important source for understanding the development of present-day Chinese writing and remains an academic discipline in its own right. Over 4,600 known Chinese characters have been identified; of these, about 1,300 have been deciphered. Despite the archaic and relatively pictorial appearance of the oracle bone script, it is in fact a fully functional writing system, fully capable of recording language, which clearly implies an earlier period of development. Unfortunately there are virtually no materials providing evidence from such a formative period. From their presumed origins as pictographs and signs from the Shang dynasty, the graphs had already evolved into a variety of mostly non-pictographic functions, including all the major types of Chinese characters now in use. Phonetic loan graphs, in which a written character borrows additional meaning from another word that resembled it in spoken language; semantic-phonetic compounds (形聲字 xíngshēngzì), with one element of a character conveying a meaning and another a sound; and associative compounds (會意字 huìyìzì) were already common. The characters or oracle bone script are not consistent in either size or structure. Though generally written from top to bottom, the configuration of the bone or shell determined a free and sometimes arbitrary arrangement. Compared to graphs on bronzes from the middle Shang to early Western Zhou period, the oracle bone graphs appear simplified, apparently because of the difficulty of engraving characters on the hard, bony materials, compared with the ease of writing them in the wet clay from which the bronzes were cast. It is known that the Shang people wrote on bamboo (or wooden) codices just like those of the late Zhou period, because the graphs for writing brush and bamboo book (冊 cè, a book bound from thin slats, like a Venetian blind turned 90 degrees) are present in the oracle bone writings. Since the ease of writing with a brush is even greater than that of writing with a stylus in wet clay, it is assumed that the Shang graphs on bamboo were similar to those on bronzes, and also that the majority of writing occurred with a brush on such codices. Additional support for this notion includes the reorientation of some graphs so as to fit better on tall, narrow slats. The more detailed and more pictorial style of the bronze graphs is thus thought to be more representative of Shang writing in general than the oracle bone forms, and it is this style that continued to evolve into the Zhou period, eventually leading to the seal script. Despite its status as a fully functional writing system, the oracle bone script is not fully mature; the form of some graphs changes depending on context, and on occasion the order of the graphs does not quite match that of the language. By the early Western Zhou period, these traits had vanished, but in both periods, the script was not highly regular or standardized; variant forms of graphs abound, and the size and orientation of graphs is also irregular. A graph when inverted horizontally generally refers to the same word, and additional components are sometimes present without changing the meaning. Not until the standardization carried out in the Qín dynasty seal script did these irregularities end. Oracle bone characters may have components that are different from those in later Chinese characters. For example, the character for Autumn, 秋, which is now written with 禾 as one component and fire 火 as another component, is carved as an ant-like creature in oracle bone script. Of the thousands of characters found on the bone fragments, the majority remain undeciphered. One good example is shown in the fragment labeled "Oracle script for Spring." The top left character in this image has no known modern Chinese counterpart. One of the better-known characters, however, appears directly beneath it, looking like an upright isosceles triangle with a line cutting through the upper portion. This is the oracle bone script character for 王 wáng ("king"). Mojikyo - Software developed by Mojikyo researchers that includes a set of oracle bone characters. Boltz,William G. 1986. "Early Chinese Writing," World Archaeology, Vol. 17, No. 3, Early Writing Systems. (Feb.), pp. 420–436. Keightley, David N. 1996. "Art, Ancestors, and the Origins of Writing in China." Representations, No. 56, Special Issue: The New Erudition (Autumn), pp. 68–95. Pinyin.info: A Guide to the Writing of Mandarin Chinese, Chinese. Retrieved August 17, 2007. Wertz, Richard R., Oracle Bones, Culture. Retrieved August 17, 2007. Woon, Wee Lee (雲惟利). 1987. Chinese Writing: Its Origin and Evolution (漢字的原始和演變). Originally published by the University of East Asia, Macau. History of "Oracle Bone Script"
This page was last modified on 21 December 2018, at 19:15.